Planning one’s financial goals systematically is a very important aspect of investing. There are many facilities introduced by the mutual fund industry which have over time become hugely popular for investors. According to the Association of Mutual Funds in India (AMFI), there are about 2.33 crore active Systematic Investment Plan (SIP) accounts and amount collected through SIP during July 2018 was ₹7,554 crore. ​SIPs enable investors to regularly invest small amounts of money and helps to create wealth in the long term to meet goals (child's education / retirement corpus) etc. But what if your goal isn't to create wealth but to efficiently utilize your investment to meet your expenses? For this, there is yet another tool which helps investors generate regular cash flows by withdrawing a pre-determined sum from their investments at fixed intervals to finance these goals, at applicable terms and conditions. It is called Systematic Withdrawal Plan (SWP). SWP enables investors to encash their investments and withdraw predetermined sums of money at regular intervals to generate regular cash flows. SWP payouts can support short-term goals, such as payment of utility bills or children's tuition fees, as well as long-term goals such as post-retirement cash flow. 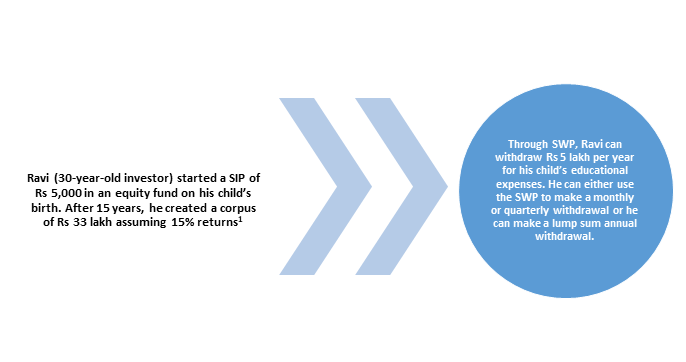 Investors can also use SWP to create cash flows for their family members (SWP Landing Page Link). Stability of income: The biggest advantage of SWP is that the investor can determine the quantum of cash flows from his/her investments. Market fluctuations aside, SWP amounts contain both the capital appreciation portion and the principal, thus ensuring a stable income stream. Customise cash flows for regular expenses: Through SWP, investors can decide the amount and timing of the cash flow to meet expected and unexpected expenses. They can withdraw a fixed amount of money at regular intervals to meet several expenses. They can use a SWP calculator to understand what suits their need best. (https://www.sbimf.com/en-us/financial-planning-calculators/swp-calculator). is subject to income tax (as per the investor's tax bracket of 10%, 20% and 30%). Mutual fund dividends are based on the fund house's discretion, and the dividend amount and frequency is not necessarily fixed. SWP is a more dependable source of regular income. Additionally, dividends are taxed at 11.648% for equity funds and 29.12% for debt funds. While long-term capital gains (LTCG) is now applicable to equity funds for a holding period of over one year at 10% (plus surcharge as applicable and cess) over gains of Rs 1 lakh and at an inflation-indexed rate of 20% (plus surcharge as applicable and cess) for debt funds for a holding period of over three years, SWP is a more beneficial option since the investor can avoid tax if LTCG on the redeemed units is less than Rs. 1 lakh in a year (while the DDT is deducted at source). Similar to the cash flow needs for your child's education, SWP can prove to be a good and tax-efficient option for generating cash flows after retirement. Note: The interest rates are for FDs for a period of 3 years to less than 5 years. Source: State Bank of India w.e.f. 30th July, 2018 for Non-Senior Citizens on Domestic Term Deposits for below Rs.1 crore. Source: Internal data compilation. Note: Past performance may or may not be sustained in future. The above examples including the taxation illustration for traditional investment are given for general information only. Load has not been taken into consideration. Units and numbers in the above calculations have been rounded off. Investments made in mutual fund are subject to market risk and there is no assurance or guarantee that the objective of the schemes will be achieved. The above illustration should not be considered as any guarantee of returns to the investors who are opting for SWP. In view of the individual circumstances and risk profile, each investor is advised to consult their investment/tax advisor(s) before planning to invest. Valuation date – July 31, 2018. The date of enrolment for SWP has been assumed on the first working day of every month. If the same is a non-business day, then the NAV of next business day has been taken into consideration for calculation purposes. In the above calculations, it has been assumed that investor falls under highest tax bracket (i.e. 30%) and total income of the investor does not exceed Rs. 50 lacs. The prevailing tax rates are as per Finance Act 2018. Tax rates could change in future and investors should consult tax advisors for the same. Gains on the redemption of units of mutual fund are treated as capital gains for income tax purpose. For other than equity-oriented schemes, gains on the investment for <=3 year are treated as Short-Term Capital Gains (STCG) and taxed at 30% while gains on investment greater than 3 year are treated as Long-Term Capital Gains (LTCG). STCG are taxed at marginal tax rate applicable to the investor and LTCG are taxed at 20% (plus applicable surcharge & cess) with indexation benefit. Calculations of tax include the amount of tax plus surcharge. At the time of the redemption of units, redemption amount comprises two parts. One is the invested amount and the other is gains on the invested amount. STCG/LTCG tax is applicable only on the gains made on the redemption units. In case of Systematic Withdrawal Plan (SWP), at the time of redemption of each instalment, investor needs to pay STCG/LTCG tax only on the gains part and not on the invested amount. Over a period of time with market appreciation, in each SWP instalment, invested amount (principal) component decreases and growth/gains part increases. Thus, it helps the investor over a period of time to consume less principal amount and thereby allowing the balance principal amount to grow further. Additionally, exemption of interest income on fixed deposits with banks is Rs. 50,000 for Senior Citizens and TDS shall not be required to be deducted on such income, under Section 194 A. The same has not been taken into consideration in the above illustration. Please note that unlike the traditional investment avenues like PPF, NSC, Bank FD, investment in mutual fund is subject to market risks. Hence, the performance of these asset classes is not strictly comparable. In view of the individual nature of the tax consequences, each investor is advised to consult his/her own tax consultant with respect to specific tax implications arising out of their participation in investments. The tax rates are as per current tax laws and are subject to change. As seen from the aforementioned tables, withdrawals through SWP are tax-efficient as one pays Rs 5,468/- /- as tax on capital gains on withdrawals of Rs 1.3 lakh compared with traditional saving instrument where one pays Rs 42,024/- on maturity.